*Okay, that last bit was a bit of a cheap shot at what is really a pretty sad situation for a lot of people. Sorry. If you have no idea what I'm talking about, here is more information. Millenialism is such an interesting phenomenon, but way outside the scope of this blog! So last night, in a desperate effort to avoid more hand-quilting, I decided to take the plunge and try sewing some simple knit pants for Joe. Now, sewing up a pattern with three, oops, four (total!) pieces would not ordinarily worry me, but I have an almost irrational fear of sewing with knits and stretchy fabrics. Actually, the fear is pretty rational. I don't have a serger (which is how the pros get beautifully finished knits), and I've had some really bad (really lumpy, really ugly) experiences in the past trying to sew knits on my good ol' 1970-something Singer. But these days, I follow a kajillion sewing blogs. So I get to see quite a few cute knit projects worked up on ordinary sewing machines. With tutorials and tips on avoiding the lumpy/curly results I dread. So I've been thinking, maybe it's time to conquer my fear and try sewing with knits more. After all, my little buglet (one of Joe's many nicknames) wears a lot of comfy, stretchy knits. It would be great if I could make some of them. He's also going through a massive growth spurt and many of his once-too-long-pants are looking like floods these days (my chubster is becoming a beanpole! sniff). So he actually needs some new pants. And hey, I love a good challenge. Especially when I'm in quilting-avoidance mode. And this is the result! Squeal!! I used an Oliver + s pattern (I'm quickly becoming a freaky cult follower, aren't I? ), figuring that if anyone could guide me through something this intimidating to me, it would be Oliver + s. These are a simple yoga pant pattern they call the "Nature Walk Pants." I was not wrong about the hand-holding. The pattern gives specific instructions for the zig-zag length and width you should use for these pants, and I do believe that might be the key to non-lumpy knits. 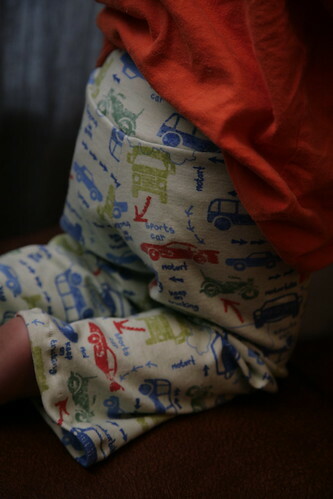 When I showed these pants to Joe this morning, I said, "Look, Joe, mama made you pants with CARS and TRUCKS on them!" Joe, my boy of very few words (and I mean, very few words), let out a very appreciative "Oooooh." Aw, thanks Joe! 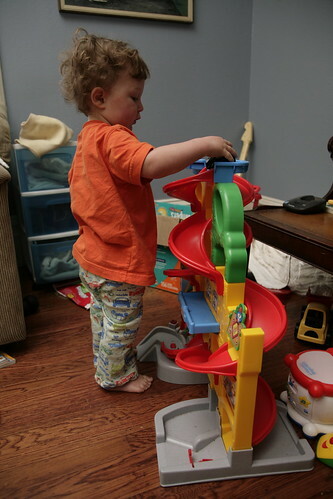 My boyish boy plays with cars in his new car pants. Watch out world, I can sew with knits! Also, I think it is totally normal for kids to be fascinated by vehicles but that people probably don't always encourage it in girls the way they do in boys. That's my theory. Maeve is really interested in trucks (and trains and cars and fire engines and diggers, etc) but, not being into them myself, it took me a while to notice. Once I figured out that she was curious about them, I started pointing out all the different kinds and now she is waaay into them. Thanks for recommending that pattern, I've been thinking of getting it. Those pants look great! I do have a serger (another old-ish Singer) but that has its own whole set of intimidating issues... however yeah, it feels somehow even more amazing to make clothes with knit fabric than with wovens, doesn't it? Anne, you're right. I actually really loved Richard Scarry's Cars & Trucks and Things That Go when I was growing up, which might explain why I'm insanely sick of it now! But I don't think I had anything like Joe's enduring passion for garbage trucks. I loved my dolls and stuffed animals, whereas Joe could care less about that stuff. Shrug. Who knows? It's true, no one, even the child of a feminist, grows up in a societal vacuum.